Embellish is a magazine which aims to fuse fashion, fantasy and art into everyday wearables and other items. 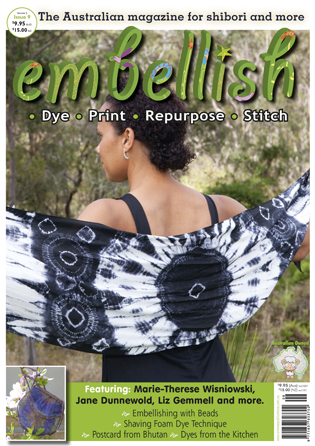 This issue published March 2012 – Embellish is published each March, June, September and December. In this issue we have a Postcard from Bhutan; a Guideline to Displaying ArtCloth by Jane Dunnewold (plus Susie Krage, Pam Relitz, Katherine Sylvan & Wrenn Slocum); an article on Dye Auxilaries by Susan Pietsch; a profile on Liz Gemmell; information on the Artist’s Liberated Book competition and more.